Children with dyslexia must be taught using an Orton-Gillingham-based program. This methodology differs in what is taught and how it is taught. Its specific sequence minimizes the need for memorization. It is a phonics system that is simultaneously multi-sensory, structured, explicit, and systematic. It's designed specifically for children with dyslexia. Tutoring should occur at least twice a week, for an hour each time, and tutoring should continue all year long even during the summer. Research by the National Institutes of Health substantiates that research-based intervention for an individual with dyslexia is instruction in reading and spelling in a way that is direct, explicit, and simultaneously multisensory. The instruction must start with phonemic awareness instruction, followed by a systematic approach to phonics, both analytic and synthetic. It must also teach reading and spelling as related subjects with intense practice and constant weaving of the concepts taught. Orton-Gillingham-based systems are excellent at meeting these requirements, and that is the research-based approach recommended by the International Dyslexia Association. 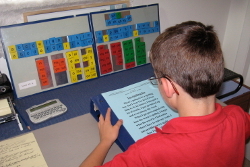 The Barton Reading & Spelling System we use is one of the best Orton-Gillingham-based systems. For more information go to www.BartonReading.com.